Culture Minister leaves Ophir Awards in protest of the performance of a song by anti-Israel poet Mahmoud Darwish. 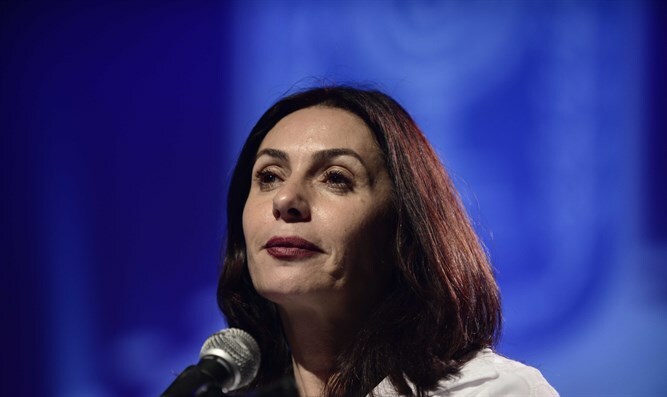 Culture Minister Miri Regev (Likud) on Thursday got up and left the hall during the Ophir Awards awarded by the Israeli Academy of Film and Television, in protest against the performance of a song by Arab ultranationalist poet Mahmoud Darwish. Darwish was a member of the Palestine Liberation Organization's (PLO) executive committee and authored a draft of what was intended to serve as the organization’s declaration of independence. He was an ardent opponent of Jewish self-determination and is seen as a figurehead for many anti-Zionists. Regev returned to the hall after the song ended. Later, as she delivered remarks towards the end of the ceremony, Regev spoke of her protest and said, "I left and I want to explain to you why. I can agree with the beginning of Darwish's poet 'Write it down, I am an Arab'. There is an Arab identity and I do not want to eliminate it. But at the end of the song he eats all of our flesh. Of the Jewish people. This is what I do not agree with. MK Yoel Hasson (Zionist Union) blasted Regev's act of protest and said, "Regev lives in a fantasy that everything revolves around her. The Ophir Awards ceremony is an important evening for Israeli cinema, for Israeli artists and is not intended for the whims of the Minister of Culture, who didn't even know who Darwish was until Netanyahu signaled to her that he is the new enemy of the nation. "Regev's embarrassing performance was staged from start to finish in order to create more headlines. Israeli Culture is not Miri Regev's private show,” charged Hasson. Defense Minister Avigdor Liberman subsequently reprimanded Army Radio commander Yaron Dekel over the airing of the program. Liberman noted to Dekel that Darwish's work includes calls for the demise of the Jewish people in the Land of Israel, as well as violent passages such as "the flesh of the occupier will be my food". Such things cannot be a part of the Israeli narrative, as the channel had attempted to frame Darwish, Liberman insisted.